Anyone who knows me well knows that I am an intensely, fiercely (and sometimes bizarrely) loyal person. Some examples: I am still best friends with girls I met in preschool. I might make fun of my family (loudly and often) but if you say something about them in front of me, watch out. I will silently hold a grudge against you for wronging my friend long long after the friend has forgotten the whole thing (you know who you are, friend-wrongers!) Unsurprisingly, I also apply that kind of crazy devotion to products and services that I love. I once bought a three-year supply of my favorite moisturizer on EBay when they discontinued it, and I still felt guilty pangs when I finally ran out and had to buy something new (to which I am now equally loyal). All of this is to say that I am a major devotée of the wonderful shoe-mecca website Zappos.com (and you should be, too, even if you are a noncommittal type). They have a million different brands of shoes, good prices, and great customer service (how rare is that?). And now Zappos is rewarding my allegiance with their beta "Zappos VIP" program. 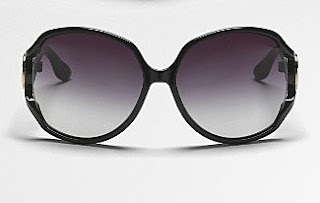 Go to http://vip.zappos.com and sign up to be a "VIP member"- it costs you nothing, and you get free overnight shipping and free and fast returns. Which means you can buy five pairs of gold sandals in three different sizes, try them on tomorrow, and return the ones you don't want and have your credit card refunded before your husband even sees the bill. (Not that I do that, honey). And, in case you are wondering, no, I'm not getting free shoes for writing this. Just the warm, fuzzy feeling that comes from sharing something great with people I care about. That's right, you are all in the circle of trust, now. God help you. This weekend we are headed out to a beach house that we rented with a group of our friends. For us, this weekend is the official kick-off to summer (I know I said that last weekend, but I ended up doing a long, involved construction project in my apartment last weekend and didn't even get a tan, so this is now the official First Weekend of Summer. Oh, and forget you, Gregorian Calendar, I am not waiting until June 21). Growing up in Southern California, I take my beach gear seriously, and when I travel out to the beach from the City, I like to wear an outfit that will take me from riding the train to building sandcastles to eating lunch in a sidewalk cafe with ease and grace (in other words, no Señor Frogs tank tops, thank you very much). Surprising cheap (and surprisingly chic) linen pants, my favorite pink pedicure shade, an extra-wide headband to prevent those unpleasant scalp-burns, and a playful striped bag to keep everything in...here are some of my favorite beachy finds. In addition the commencement of the months-long process of perfecting my summer bronze (I'm sorry, okay? 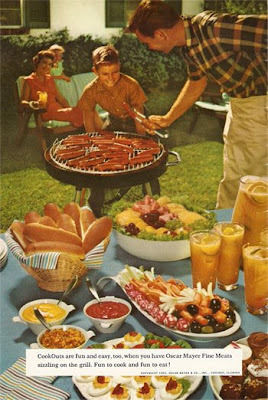 I can't help it), Memorial Day signals to me the beginning of Grill Season. During Grill Season, I make a habit of trying to use my oven and stove as little as possible, and cook most of our meals outdoors on the grill (while simultaneously working on my tan- see how that works?). And lately, nothing is tempting me to fire up the grill quite as much as my famous insanely-delicious inch-thick die-and-go-to-heaven Hamburgers. In the past, I have been guarded about sharing this recipe out of pure selfish proprietary-ness, but you know I don't have any secrets from you, my dearest darling readers. Please note that these burgers are what the Cookie Monster would refer to as a "sometimes food". If you eat one of these suckers every day, they will, eventually, kill you. Luckily, the suntan does wonders to disguise the cellulite. 2 tablespoons butter, sliced into 4 1/2-tablespoon pieces. Medium-sharp cheddar cheese, sliced 1/4-inch thick (optional). 1. Turn on your grill and preheat it to medium heat (if you are working with charcoal, just make sure the high flames have died down before you attempt any cooking). 2. Dump all the ingredients (except the butter, cheese, buns, and spray, duh) into a large mixing bowl, and mix them together with your (freshly-washed) hands. Don't overwork it- it shouldn't get mushy and playdoh-y. 3. Divide the mixture into 4 equal-ish parts and form into nice, thick rounded patties, surrounding a piece of the butter (just roll with it). They should hold together, but again, not be overly mashed together. 4. Spray or rub grill with olive oil, and place patties on grill. Cover and cook for 2-4 minutes. When the bottoms are well browned, but the top of the patties are still quite pink, flip them, and cook for another 2-4 minutes. For the last minute, you can add slices of the cheese to the top, so they melt. 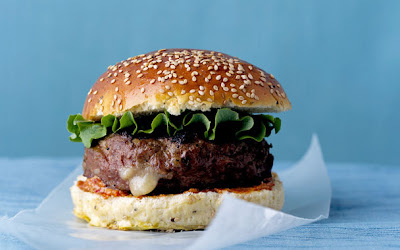 The trick here is that you should have it in your mind to undercook the burgers, and pull them off the grill when they are still fairly rare on the inside. They will continue to cook once removed from the grill. The worst thing you can do to my burgers (and thus, me) is to cook them into a charred, dry, gray oblivion. 5. Place the buns or English muffins face down on the grill and cook until lightly toasted, about 30 seconds. Stack the burgers on the buns with lettuce, juicy tomatoes, sliced avocado... anything your heart desires. Just try to serve a salad or something on the side. 6. Grab about six napkins, sink your teeth into that burg, and watch your world change. Note: If you don't have a grill you can buy a grill pan and use it right on your stove. However, you may need to also buy an indoor tanning light for your kitchen, if you want to simulate the whole process. I don't want to make presumptions about your life- I mean, for all I know, you could be way better at doing laundry than I am. You might be the Lord of the Laundry. The Sultan of the Spin Cycle. The Professor of Permanent Press. The Dean of Dryer Sheets... But if you're not, here's a primer on my processes and the products I prefer. 1. Get Sorted. Unless you have never watched a sitcom in your life, you should probably know that mixing red clothes and white clothes in the washer will result in pink clothes. 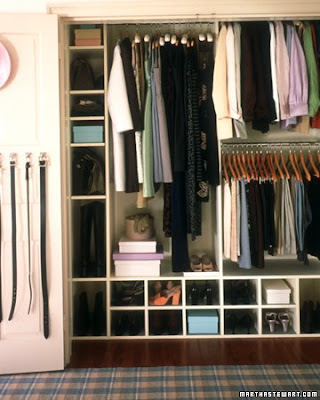 I sort clothes by color (darks, brights, whites), and by type (towels together, delicates separate). I have a hamper with different sections so I can sort things as I use them. 2. Pretreat Her Like a Lady. The surest way to never get a stain out of an article of clothing is to wash and dry it without pretreating. I use Oxi Clean Spray Stain Remover , $5.50, from Amazon.com- I think it works better than Spray 'N Wash, and even better than messy, damaging bleach. 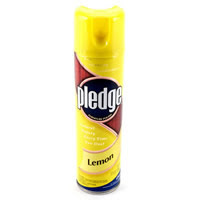 Spray it directly on a stain and rub the fabric against itself. It's good to let it sit for a few minutes, but don't leave any laundry product on your clothes for more than a couple hours as it will damage the fibers. The other day I spilled half a glass of red wine on my white dress, and this stuff got it out easily- I felt like Billy Mays. 3. Brighten Up. In addition to regular detergent, I always add a brightener to the wash. I like Biz, $5, best, but you can't buy it in New York, so I use Clorox 2 , $7. I find they really work to keep whites from getting dingy and keep bright colors from fading. And they also work at getting out stains. 4. Dry a Little Tenderness. I tend to set my dryer to "Light Dry" to prevent the dryer from cooking my clothes. I'll pull out sweaters and t-shirts and jeans, smooth them out and let them finish drying in the air (which keeps them from getting deep-set wrinkles), but I'll let towels and such dry all the way. 5. Get Into the Fold. Not to sound like your mom, but your laundry isn't really done until it's folded and put away in your drawers. If you fold your laundry while it is still warm from the dryer, you can smooth out most wrinkles before they set, but if you let your laundry sit in the dryer until it cools, you ain't never getting those things out. Follow those steps, and you'll be the Swami of Suds. If you weren't already. Watching this video makes me form all kinds of theses about the relationship between commercialism and art. But rather than subject you to my (sure-to-be-perspicacious) musings, I think it might be more fun for you to just watch the darn thing. P.S. Any idea where I can find eye-masks like that? To die for. Remember when you bought that great slipcovered sofa and you were all, "oh great, I can wash it when it gets dingy, and then it will always be like new"? But then, you lived with it for a while, and it got a little dingy, and the more you thought about washing it and dealing with all that fabric the more it seemed easier and more logical to just buy a new sofa (preferably one made of plastic)? Yeah, me too. But then logic intervened, and I decided to give slipcover-washing the old college try. And, you know what? It's not so bad. 1. Act Fast. Clean up individual spots as they show up- don't let the situation go for too long. You can wait for your guests to leave before you attack the spot of dip they dribbled on your cushions, but don't pull the old "eh, we're having another party next month, I'll clean it then" move. If the spill is on one of the cushions or pillows you can remove the cover, treat the spot and wash it pretty easily. If the spot is on the arm or body of the main piece of the cover, you may just want to treat it right on the couch, like you would upholstery, with a clean rag, a spot treater, and a bit of warm water. 2. The Big Show. When you get that all-over dirtiness that warrants a full slipcover cleaning, don't panic. Remove the covers from all of the cushions, pillows and the couch. You may need to vacuum up some crumbs and gunk, or you can just shake it out (if you are more concerned with your sofa than your floor). Lay out the covers to check for spots, and treat each one individually with a spot treater. I like OxyClean or Spray 'N Wash. Let sit for a few minutes. Load the covers into the washing machine- do up all the zippers and Velcro, to help them keep their shape. Use a small amount of your favorite detergent, as well as a wash-booster, like Biz or Clorox 2. 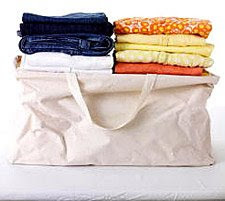 As with your other laundry, light colors can be washed in warm water, but dark colors should be washed in cold. When the wash cycle is over, check on the stains you treated in the beginning, as you may need to treat them and wash again (see? You should have treated them right away). 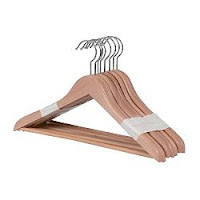 Load them into the dryer, and dry on gentle for just 10-20 minutes, until most of the wrinkles are released, but the slipcovers are still quite damp. Put the covers back on the couch and smooth the damp fabric into place. Allow to dry completely (it's a good idea to wash them at night, and let them dry while you sleep). 3. Spray Away. 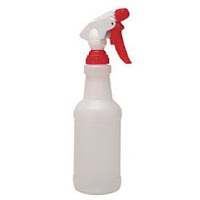 If there are lingering wrinkles, or if you leave the slipcovers in the dryer too long and they have shrunken too much, load a clean spray bottle with warm water, and mist the problem areas. The water will release the wrinkles, allowing you to tug and stretch the fabric smooth and even. In the meantime, take that change you found in between the cushions to the bank to start your Plastic Couch Fund. Italy has provided the world with many cultural and culinary innovations — aqueducts, gelato, Michelangelo's David, lattes, umbrellas (seriously, they were invented in ancient Rome, look it up) — but I would argue that one of the country's finest accomplishments is pesto. 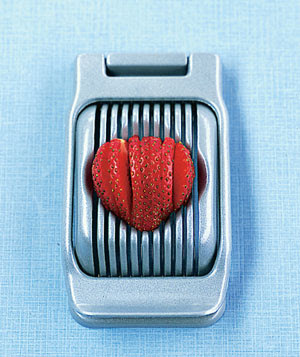 A combination of seemingly simple ingredients, the sum of its parts is truly greater than the parts. 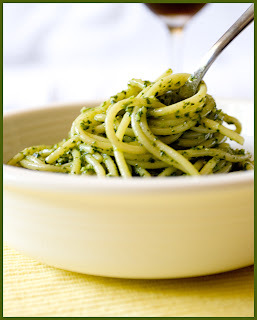 Pesto is one of those miracle foods that can be used a million ways and pretty much makes anything taste better. For those who play by the book, it obviously makes a stellar pasta sauce, but use your imagination a bit, and it can be eaten as a sandwich spread, a salad dressing, a pizza sauce, on scrambled eggs, on bruschetta, as a dipping sauce for bread or crudite or a zesty topping on steak, fish, or lamb. Saucy! About 4oz (or like, 2 cups) basil, with the stems removed. 2/3 cup shredded or grated Parmesan cheese — get the good stuff. 3 cloves garlic (just don't plan on kissing anyone right after you eat this. Or just feed it to the person you intend to kiss, too). 1/2 cup extra virgin olive oil — again, it's worth is to splurge for great ingredients. Put the cheese, pine nuts and garlic in the blender or food processor and blend until ground up and consistent. Add the oil and the basil, and blend until creamy and, well, pesto-y. Store in a jar in the fridge. If you won't eat it all within a week or so, freeze extra pesto in an ice-cube tray. Defrost individual cubes, as needed, for a quick dinner-fabulizer any time. With the thousands of projects, home renovations, ideas for blog posts, inspiration tear-sheets, recipes, and crafts I have going at any one time in my big ole head (and little apartment), most of the time I end up feeling... let's just say, less than organized. To keep from having big sloppy piles of paper everywhere (and don't get me wrong, I still have big sloppy piles of paper in some places), I try to keep almost everything on my computer. And to keep from having a big jumbled mess of files on my computer, I use a few different tools. Two of the best are Google Notebook and Dropbox. 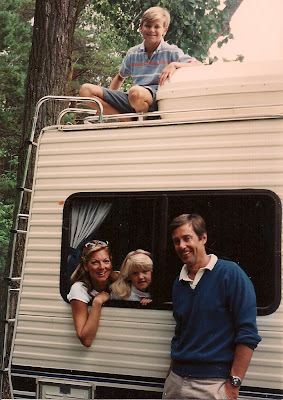 I've found that the problem with writing about technology and the Internet is that, if you know more than I do about computers, I probably sound like a rube trying to describe these services, and if you know less than I do (Hi, Mom and Dad! ), it still might sound complicated. Either way, one of us ends up embarrassing ourselves. But both of these technological innovations have improved my life immeasurably, so I have decided to brave my technophobia and share them with you. Google Notebook is basically a scrapbook on your computer. Google puts an icon in the bottom of your browser window (see the notebook icon, pointed out by my red arrow?) and you can just click it when you come across something you want to save. Here, I am saving the link to this pretty picture of beach umbrellas. You can save websites, photos, or even just "clippings"- a quote that speaks to you, say - into your various notebooks, and attach your own little notes to it. I have notebooks for everything, from frequently-referenced recipes, to cute shoes I might buy (but need to think about), to a file of inspiration for my future roof deck. It's sort of like "bookmarks", but much, much, better. Dropbox is a service that was recommended to me by my friend and technophile, Vinny. It's essentially like having an external hard-drive for free, on the Internet. So you can easily save things (think photos, music, and other large files) and reference them without having them take up space on your computer's hard drive. Here I am (in the photo above), saving the beach umbrella photo to my photo file in my Dropbox. You also receive a "public" folder, which gives you the ability to create a link to download any file in your Dropbox (a great way to share things with friends- it's how I can post downloadable pdf's on this site). And, if you want to access those files, all you have to do is click on the pic of the box on the menu (pointed out here by the red arrow). There- See, that wasn't so bad, was it? For my next trick, I will attempt to explain the Amygdala to a room full of brain surgeons. Furthering my mission to get people eating vegetables they think they don't like, today I present to you the humble beet. I don't know what it is about beets that is so terrifying to people (are you worried they might get on your clothes? ), but they are truly deserving of your love and affection. They are rich in fiber and nutrients they contain pretty much every vitamin in the alphabet, and are a sweet treat to eat. 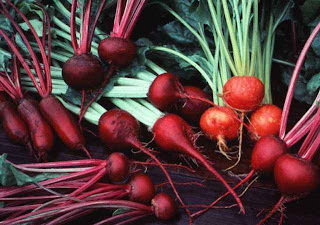 Beets are wonderful in salads, as a side-dish, baked and salted like homefries- you name it. The easiest way to cook beets is to boil them for 30-40 minutes, or until you can easily poke them with a paring knife. For an added flavor-kick, throw some orange peels in the water with them as they boil. Once they are cooked, let them cool for a few moments and then the skin should peel off easily (you may want to wear gloves while you peel 'em, or it won't just be your little finger that's pinky- harhar). 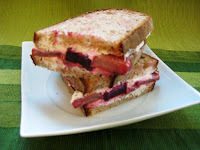 Here's my recipe for a killer beet sandwich that you really should try. Yeah, you heard me - a beet sandwich. Don't knock it till you've tried it. Spread the goat cheese on both pieces of bread. Place the beets and greens inside. Enjoy. A final (somewhat delicate) note on beets, important to know if you have never eaten them: they may cause your pee to be a little red the next day. Don't worry- you aren't dying (at least not of that). In the immortal words of the King of Pop, "Just Beet It". 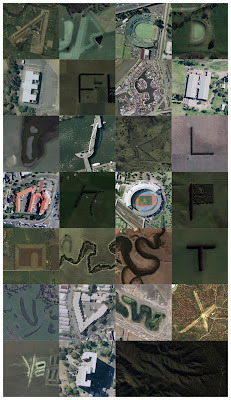 Check out this awesome alphabet created from photos of geological features from GoogleEarth. I think it would be particularly cool blown up to poster-size in an eco-themed baby's room (maybe above the recycled-wood changing table with biodegradable diapers). That way, your baby could learn the alphabet, ecology, and geography all at the same time. The baby's handwriting probably wouldn't turn out to be that good, though. Is it obvious I don't have children? 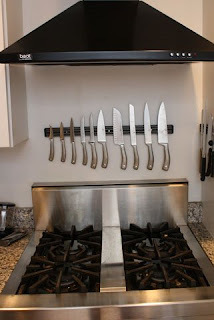 One of my prized possessions is my complete set of gorgeous stainless steel Wusthof knives. Due to some Iron Chef fantasies and the fact that I allowed my husband to go crazy with the registry scanner thing at Williams-Sonoma (ill-advised, ladies), I ended up with the full set — from the tomato knife to the bird-beak parer. If you are not headed down the aisle soon, the prospect of buying a nice set of knives is a frighteningly exorbitant one (you better hope those knives are real sharp when they take that arm and that leg). In the cheap, industrial, knife world there are certain brands that get rave reviews: Dexter-Russell, Kiwi (from Thailand) and Forschner are especially popular. All you really need is a good large chef's knife (an absolute necessity for chopping onions...and all vegetables, really), a sharp paring knife, and a serrated knife for cutting bread and tomatoes. You can add additional blades to your collection gradually as needed. Here are some great sources for cheap knives, but if you have a restaurant supply store in your town, nothing compares to actually holding the knife in your hand to see if it's a comfortable fit. Aren't you sharp. Most of the time, imitations just can't compare to the original. I give you: Spraytans. Toupees. Press-on nails. But every once in a while, the "fake" version actually holds its own, and that (you may be surprised to hear me say) is the case with cake mix. Don't get me wrong, I still prefer to bake things from scratch when I can, but sometimes you just really need a shortcut (when two coworkers birthdays fall in the same week, say). But I'm not crazy- I draw the line at the pre-made frosting from a tub, which, to me, doesn't come close to the real thing. My easy peasy buttercream frosting recipe goes perfectly with any of these cakes. Start with simple yellow or vanilla cake mix, and replace the water called for on the box with fresh squeezed lemon juice, add one tablespoon of lemon zest. Spread raspberry jam between the layers (or drop half a tablespoon into the batter of each cupcake, and decorate with fresh raspberries. Start with Devil's Food cakemix, and replace the water called for on the box with Creme de Menthe liquor or Pepperment Schnapps (or use the water and 2 tablespoons mint extract). After frosting, decorate the cake or cupcakes with fresh mint sprigs (or Andes mint candies). Start with chocolate cake, and replace the water called for on the box with orange juice. Add one tablespoon of orange zest. Decorate frosted cake or cupcakes with candied orange rind. (no one said it was going to be good for you). Feel free to add citrus zest, cocoa powder, or anything else that you think will taste good in it. And no one will ever know you were faking it. Unlike, say, those clip-in hair extensions. Thanks for always saying, "aw, you could do that," and meaning it, and then actually helping me figure out how to do it, so I grew up with the confidence (however false), that I could take apart a sink drain, install an icemaker or a dimmer switch, reupholster an ottoman, hang a chandelier, (or even start a blog), if I wanted to. And thanks for uncomplainingly climbing under the sink, replacing the fuse, and pulling out all those tacks when I inevitably screwed up a few times in the learning process. Also, thanks for single-handedly rebuilding my kitchen cabinet while I was away at a wedding last weekend. I'm not sure, but I think I'm pretty lucky to have you. P.S. A big Happy Mother's Day to Marta, the warmest and kindest mother-in-law a girl could hope for, and Happy 1st Mother's Day to Kelly- I can already tell that you are going to excel at motherhood like you do at everything else! If you are familiar with my wizardly wordsmithery, today's title may have you wondering what this post will be about: Do I mean "green" as in money? As in salad greens? Or maybe as in eco-friendly? Well, in a personal best, the title of this post is a triple-entendre because it is actually about all three of those topics. No, no, no need to applaud. Your presence here is more than enough. Today's tip is to compel you to buy heads of lettuce and wash them yourself, rather than the bags of pre-washed stuff. 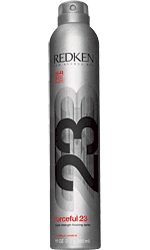 Ultimately, it will save you a surprising amount of money, will stay fresh and green longer, and is a smarter choice for the environment. 1. 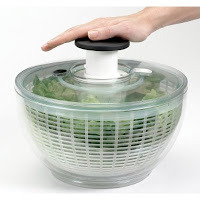 Invest in a Salad Spinner (I like the OXO Salad Spinner , which is roughly $25 on Amazon.com). Or, if you don't want to spend the money on getting one for yourself, just get married, and I swear you'll end up with, like, six of 'em. 2. Pull each leaf off of the stem individually, down to the smallest center leaves which will snap off like a cute little mini head of lettuce. This will keep them looking their best (as opposed to just trying to rip them all off in one fell swoop, which will mangle them). 3. Fill a bowl with cold water and dunk all the leaves into it, swishing them around a bit. After about 30 seconds, all the sand and dirt from their leaves will settle at the bottom of the bowl. Take the leaves out and place them in the basket of the Salad Spinner. Dump out the dirty water. 4. Use the Spinner according to directions- with the one I have, you just have to press down a button a few times. 5. To store the lettuce for later use, wrap the leaves in dry paper towels and place them in a clean Ziplock™ bag in your fridge's Crisper drawer. 1. It is remarkably cheaper. At my grocery store, a head of organic romaine is $2.75, and a clamshell package of pre-washed romaine is $4.99. That means that over the course of a year, a family of four can save $100,000 by washing their own lettuce (okay, I made that up, but you can save a lot). 2. It will last longer. When stored properly, washed lettuce will stay fresh and crisp for up to ten days. Seriously. (Unlike that pre-bagged stuff that wilts and tastes like plastic on the first day). 3. It's better for the environment. 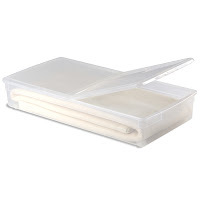 You can rinse and reuse the same Ziplock™ bag indefinitely, instead of throwing out all of those soggy lettuce bags (Or worse those hard-plastic clamshells- Tsk tsk). If you also buy organic, then we'll really be talking. 4. It may be safer. 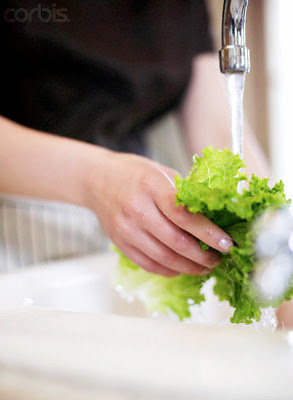 Some experts say that pre-washed lettuce is not truly safe from e coli and other bacterial contamination, and that you should wash it again before eating. So you might say that just washing your own lettuce in the first place could save you from getting green with a food bourne illness. Get it!?! - a fourth meaning for green! No? Okay, that one was a little weak. But, come on, admit it, those first three were freaking brilliant. Move over, Will Shortz. A lot of you have written me to ask about the wildfires in my hometown of Santa Barbara, California. The fires broke out on Tuesday afternoon, and have spread quickly toward the town, due to high temperatures and unpredictable winds, destroying many homes and injuring several firefighters. So far, my friends and family and their homes are all safe, although many have had to evacuate (some for the second time this year). Santa Barbara is a little piece of heaven on earth- located between the beach and the mountains, it is beautifully temperate all year. 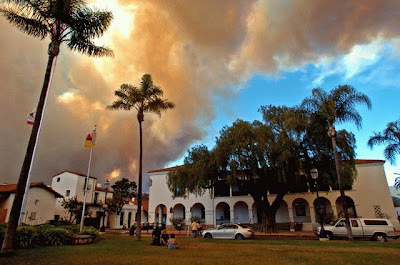 But every place you might live has a downside (for instance, in New York there is always a chance you might come across someone peeing between two cars), and Santa Barbara's downside is these types of fires (oh, yeah, and the occasional earthquake). Some part of my mind is always dreaming about Santa Barbara, and I hope that you all will keep those whose homes are in jeopardy, and the brave firepeople who are fighting the blaze in your thoughts. One of the greatest joys of living in Manhattan is that you can have any cuisine your little multicultural heart desires delivered to your door in under an hour. You can eat Mexican on Monday and Turkish on Thursday, and send your stomach all the way around the globe in between. But all that taste bud travel adds up, and by the time you tally up your delivery bill, it seems you might as well have really gone on vacation. The good news is, that in these days of trimming back expenses, you don't have to settle for mundane meals. A little imagination and ingenuity (and canned coconut milk) goes a long way. Here's how to make an easy and deelish Thai dish yourself in half an hour (it might not be totally authentic, but your stomach won't know the difference). Feel free to eat it with disposable chopsticks out of a take-out container, for that just-like-delivery feeling. Next stop: India. 1. Follow the instructions on the bag or box of rice to get that cooking, as it will take the longest. 2. If you are using the chicken (and I should mention that it is equally delicious without it, and even more healthful), heat 1 tbsp olive oil in a large, deep pan or pot. Slice the breasts crosswise into 3/4 inch strips, and season with salt and pepper, and add to the pan, cooking until opaque and slightly browned. Put the chicken on a plate and set aside. 3. Into the same pan or pot, put the remaining olive oil, and the garlic,ginger, jalapeño, green curry paste, and just the milky solid part at the top of the can of coconut milk (to get this, DO NOT shake the can and open carefully with a can opener. Scoop out the solid, which will have risen to the top, with a spoon, leaving the watery portion in the can to be used later). Stir the ingredients together in the pot until they are well mixed, and start to bubble. Add the vegetables (except the peas) and cover over low heat for about 5-10 minutes, stirring occasionally. 4. When the vegetables seem to be nearly cooked through (you will be able to pierce the potato easily with a fork), add the watery part of the coconut milk, the peas, most of the herbs (save a little for garnish) and the chicken to the pot. Cook until the peas are bright green and cooked through, maybe 1 minute. Serve over rice and garnish will remaining herbs. 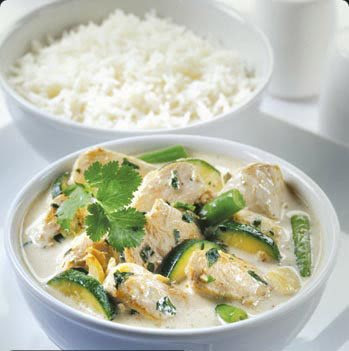 You'll have the Thai of your life. Obviously, you all know that I'm a super-hip techno-sophisticate on the World Wide Interwebs. But, while I like the emails fine, I still believe that nothing compares to getting an unexpected letter or a package in the real mail. So imagine my delight and surprise to receive a lovely little care package out of the blue from my Aunt Midge. Inside, I found a very cute striped apron (right up my alley), and several little hand-embroidered linen cocktail napkins which had belonged to my grandmother, and two little silver ivy leaf dishes which had been my grandfather's. I almost cried (but like my mom, my aunt, and my grandmother before me, I am tough as nails, so I held it in). The lovely little collection of gifts was wrapped carefully in tissue and came with a note that said they were, "items only a twenty-seven year old housewife could appreciate — they all require labor, either ironing or polishing, but I'm assuming you're into it, unless you are like Barbara Stanwyck in Christmas in Connecticut and the whole thing's a sham". 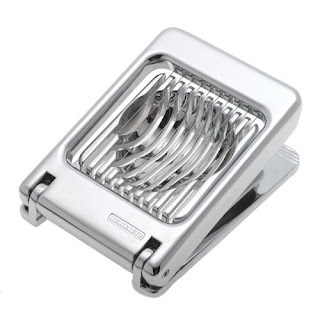 FYI, the whole thing's not a sham although my fastidious husband does most of the silver-polishing around here (and you should Netflix that classic). Thanks, Midge! Shortly after receiving my mailed treasures, I saw a great post on one of my favorite blogs, Inchmark Journal, about some sunshiny care packages the author, Brooke, sent East from her new home in California. Wouldn't you love to get one of these on a dreary day? It made me think of all the people on my life who deserve a little package of happiness in their mailboxes, for no good reason at all. I'm determined to find the time to gather some goodies and mail them out far and wide (but, knowing me, it might take a while). Until then, people I care about, you'll all have to settle for these little missives. Think of them as cyber-care packages arriving via electronic post.